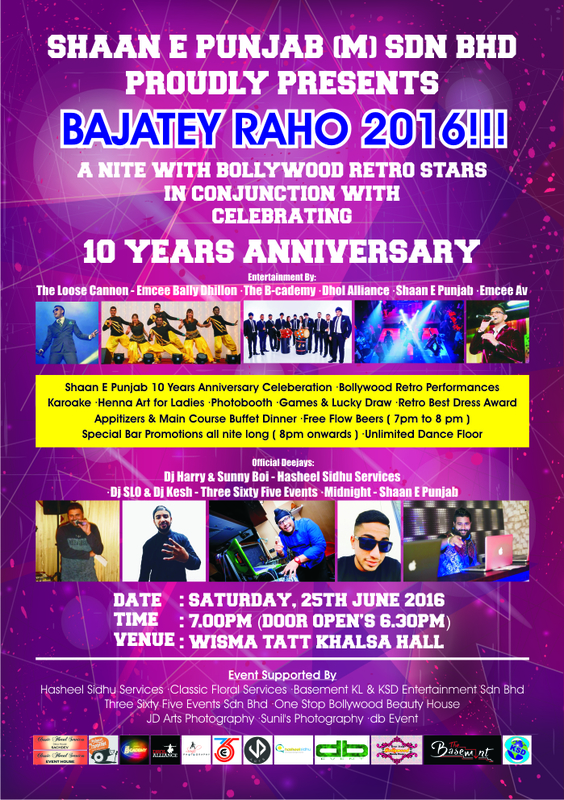 Shaan E Punjab, a Malaysian-made bhangra and Bollywood dance group, celebrates its 10th anniversary by throwing a Bollywood-themed night called Bajatey Raho on 25 June. “We have been part and parcel of the local Punjabi entertainment scene and culture for the last decade. It has been quite a journey,” Balvinder Kaur, more popularly known as Raj Saigal, tells Asia Samachar. The bhangra group which began with eight dancers today has has grown to about 50 members. Apart from Raj, the other key managers at Shaan E Punjab are Ravinder Singh (Ravin) and Jogindar Singh (Joe Randhawa). Apart from giving audience a power packed dance and bhangra performance, they also handle event management for for birthdays, weddings and corporate functions. They supply music machine and sound system together with DJ, singers and emcee services. The also have up to 10 professional dhol players. The planned Bollywood Retro Night on 25 June (Saturday) will be held at Wisma Tatt Khalsa, Kuala Lumpur. Tickets are priced RM50 at the door. To get early bird tickets, priced at RM40, call Ravin at 0162299660, Raj at 0172432466 or Avtar at 0162052107. Contact: Ravin 0162299660, Raj 0172432466 or Avtar 0162052107.